These volumes contain easy-to-play arrangements of great classical melodies. The arrangements allow the music to be introduced to younger students. 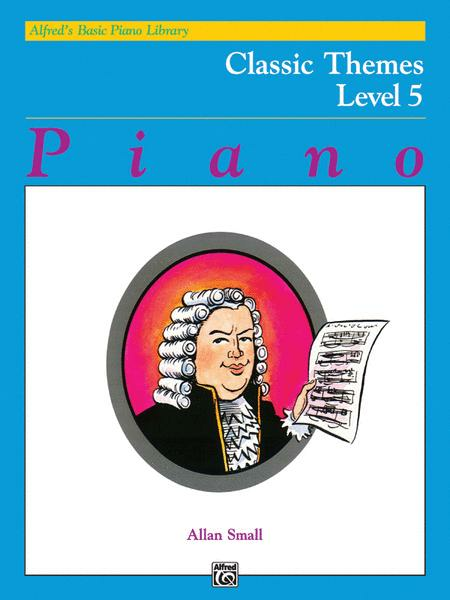 While designed to correlate with Alfred's Basic Piano Library, Classic Themes may be used with any piano method or instruction course. Titles: Angel's Serenade (Braga) * Annen Polka (Strauss) * Aria from "Don Giovanni" (Mozart) * Drinking Song from "La Traviata" (Verdi) * Estudiantina (Waldteufel) * Forsaken (Koschat) * Gypsy Dance from "Carmen" (Bizet) * June Barcarolle (Tchaikovsky) * The Last Rose of Summer (Moore) * Lesson 2 (Hook) * Love's Greeting (Elgar) * Mirror Dance from "Faust" (Gounod) * Piano Concerto No. 2, Opening Themes (Rachmaninoff) * Piano Concerto No. 21, Theme (Mozart) * Prelude, Op. 28 No. 20 (Chopin) * Tambourin (Rameau) * To a Wild Rose (MacDowell) * Toreador Song from "Carmen" (Bizet).